Until now, the digitalization of administration has been has been characterized either by accelerating or by increasing the efficiency of existing processes. The use of blockchain technology offers the further potential not only to simplify this, but also to increase transparency in the administrative processes. 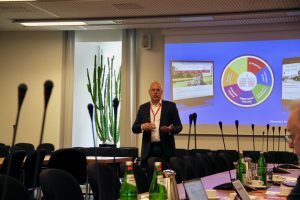 Efficiency, transparency and governance models were in the focus of the Blockchain & E-Government event organized by the eco Competence Group Blockchain. On 7 September, around 25 experts and interested parties came together in the assembly room of the town hall in Dusseldorf. The visitors were welcomed by Jürgen Gerreser, responsible for the market development of Mobile/ICT and Startup Support for the state capital Dusseldorf. 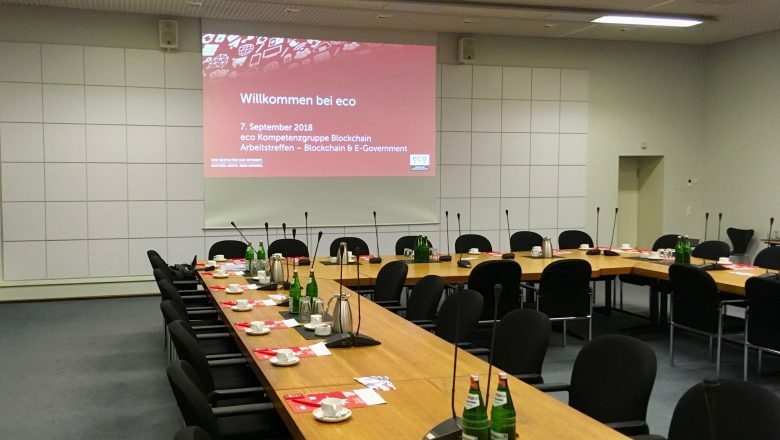 Following this, Stephan Zimprich, Leader of the eco Competence Group Blockchain, gave an overview of the agenda and introduced the topic. 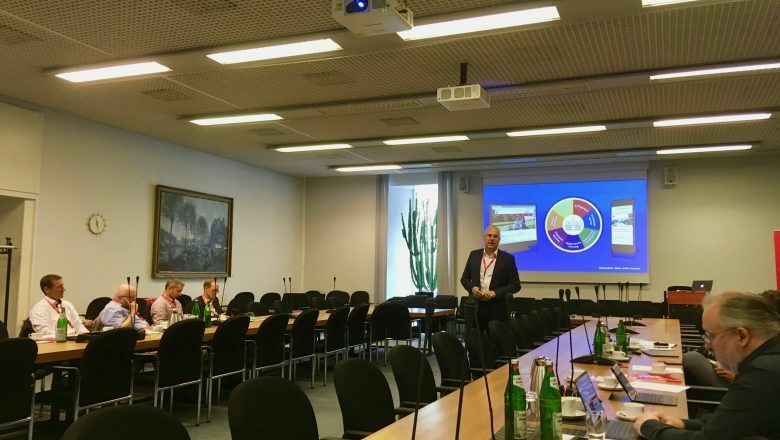 The first lightning talk of the day was given by Peter Adelskamp, CDO of the City of Dusseldorf, who gave an overview of the state of digitalization of the city’s administration. Using the new service portal started in June 2018 as an example, he explained the process of digitalizing services and discussed with the participants where he sees the potential and useful points of contact for the use of blockchain. Dr. Thomas Rose from Fraunhofer FIT then took the stage and gave an overview of which characteristics of blockchain technology, in his opinion, are especially helpful for the digitalization and automation of administrative processes, and how these could be used. 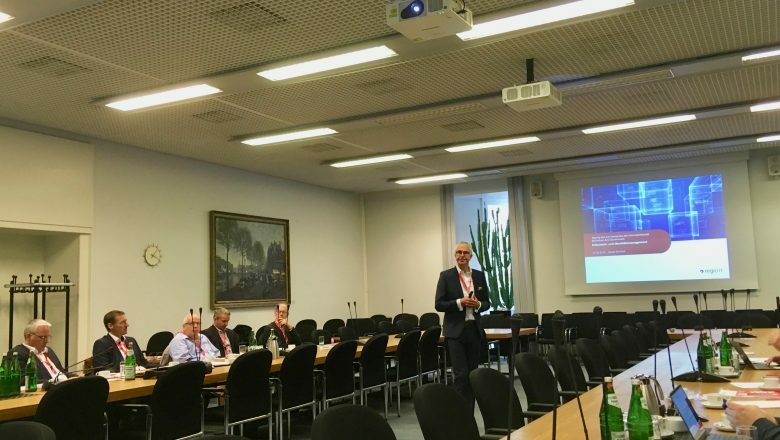 Dieter Rehfeld from regio IT, on the topic of document and identity management with blockchain, explained that the use of blockchain makes sense everywhere where administration registers changes of rights, and records these changes unambiguously, verifiably, and indelibly. The blockchain would not replace a register, but rather would connect existing registers with one another. Concluding this topic, Guido Weiland, Head of the Innovation Center at Materna GmbH, showed how digital services for citizens could be built and implemented on the basis of a blockchain. Following this, the participants discussed which governance models are possible for the operation of blockchains in the area of e-government, and their respective advantages and disadvantages. For this, for example, existing municipal cooperatives could be used. E-government processes have, as a rule, a legal foundation. This is a clear difference from disruptive business models that are being implemented with public blockchains. Blockchain in the context of e-government is normally used for the implementation of functional requirements, in which the consensus of a community cannot be taken into account.